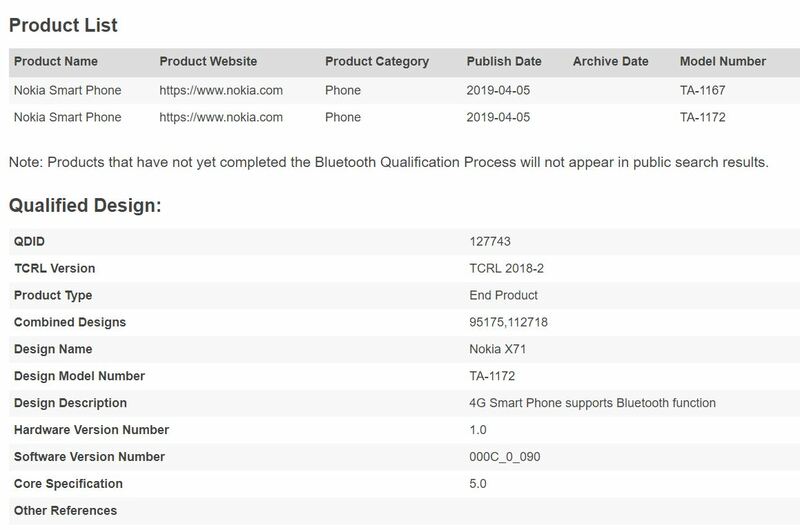 The newly announced Nokia X71, that is at the moment on pre-orders in Taiwan, appeared in Bluetooth SIG database. The device appeared in two variants, TA-1167, which is the model for Taiwan as confirmed by the user guide at Nokia.com, and as TA-1172, which is the model for China, as confirmed by TENAA. BT SIG certificate confirms the device features Bluetooth 5.0, and that’s about it. The X71 seems like an interesting device, bringing a lot of novelties to the Nokia lineup of smartphones, such as a 48MP camera, an ultra wide-angle camera, punch-hole display and even the LED notification light in power button, considering the 3.2 and 4.2 that have that feature aren’t on sale yet. You can check the rest of the specifications of Nokia X71 here. The device in 6GB/128GB memory variant retails in Taiwan for €345. The global availability is unknown. #GSMArena readers want a next #Nokia Camera phone. Here is what we think about it.